This work is mounted on a painted canvass. The canvas dimensions are 12 x 16. A designer frame is included. No glass. 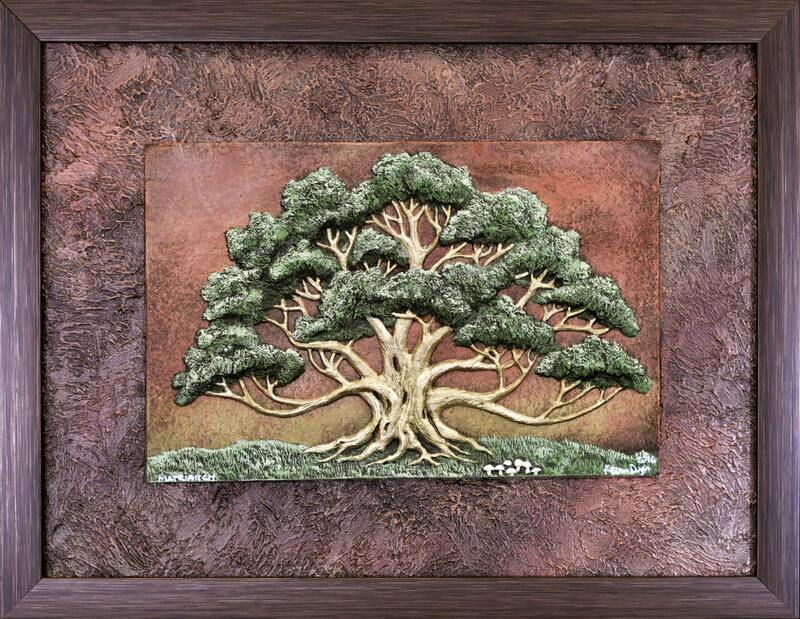 This beautiful spreading oak makes a wonderful mother’s day gift or grandmother gift. Paper is the traditional 1st anniversary gift. Each one of these works is Handmade and Hand Painted by the artist. These are not flat paintings!!! 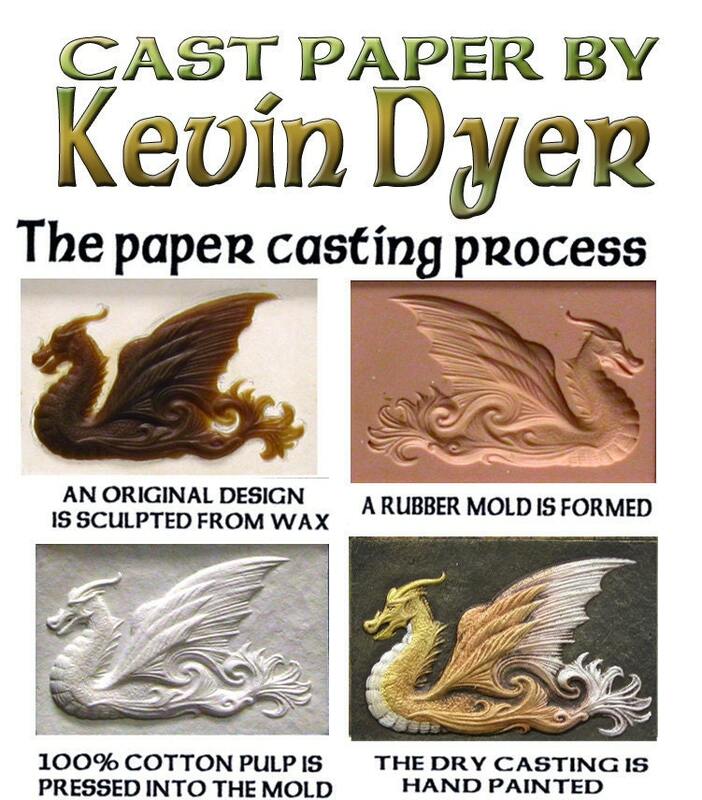 They are painted 3D castings!!! Paper casting is to me the perfect medium. It allows me use almost every skill set. A typical piece begins as a drawing or two. Then I sculpt it in wax. This is a long refining process and often the image sculpted is far different that the drawing. Then I build a dam around the wax and pour a rubber mold directly off the surface. A casting is made by pressing wet cotton pulp into the mold and extracting the water. Then I finish the surface. While every piece that emerges from the mold is about the same, no two are really painted the same. Maybe I would if I could, but the painting process is always in flux. I am always experimenting with ways of mixing colors or washes and hard edge or new pigments. I spend about 75% of my time with the painted finishes. When I see or dream a thing that moves me in that way I try to distill the essence of it and add it to my bag of tricks. I am something of a student of ancient art and particularly interested in Celtic history, but I am not interested in reproducing artifacts or furthering a traditional technique. There was an original impulse for man to do art in the first place. Images and objects that take us out of our day to day consciousness. A magic icon or at least a feeling that allowed the viewer to step out of the ordinary world of words and survival and allow a more ancient wisdom to arise. I am looking for that magic. All Order is the continental U.S. placed by 12/17 should arrive in time for Christmas. Each piece is hand made, hand-painted and there is a only 1 to 2 molds for each piece. These are not mass produced!! Please allow up to 7 days to ship, however in most cases items do ship in less than 3 days. If you need the item by a certain date please let me know and I will do everything I can to accommodate. I guarantee complete satisfaction on every piece. In the rare event that something is not satisfactory please contact me and I will exchange or refund. I can only refund to the original purchaser, I will only exchange items received as gifts.